0.1 kW x 8,760 hours = 876 kWh. Quite a lot, really, just to light a room! 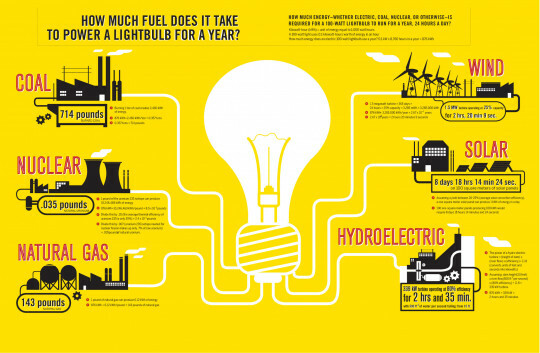 The graphic proceeds to explore what it would take to produce that much power from each of our common energy sources. Interestingly, only one of these sources is something you can own - and that, of course, is solar. (While you could own a wind turbine, the one in the graphic is a 1.5 MW turbine, definitely not something to put in your backyard!) To be fair, the graphic assumes an installation of 100 square meters which is 1,076 square feet, and that is significantly larger than most residential solar systems. If your system is smaller, it takes longer for your system to keep the light on, but the end result is the same: your own power source meeting your needs, with no pollution or long-lived waste products to worry about. On the other end of that scale is the coal plant where our light bulb requires us to burn nearly half a ton of coal and emit over a ton of CO2 in the process! The good news is that both that wasteful incandescent light bulb, and coal-fired power plants are going away, just not fast enough. (Changing out your old 100 Watt light bulbs with efficient LEDs will drop these numbers by more than a factor of five.) Every solar installation directly reduces our greenhouse gas emissions - and saves the system owner substantial amounts of money over the lifetime of the system.